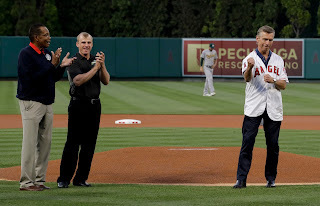 Much of the attention paid to the Rod Carew double transplant has been, understandably, about the heart transplant, But Sir Rodney also received a kidney from Konrad Reuland, and I'm quite sure that's why David Eckstein was involved in Tuesday's pregame ceremony. Eckstein, the shortstop for the 2002 Angels team that won the World Series, is a member of a family with a legacy of kidney problems. Stories on the Ecksteins sum the family up thusly: Everybody is either a kidney donor or recipient. Eckstein a couple of years ago was reportedly preparing to be donate one of his kidneys to a sister. I looked this week but did not find any stories indicating that the surgery had actually happened. His older brother, Rick, minor league hitting coordinator in the Twins organization, has already donated a kidney to another brother. Buddy Boshers was one of the last men cut in training camp. He wasn't pitching particularly well in Rochester when the Twins decided to ship out Aldaberto Mejia, but he was on the 40-man roster and he was available to pitch, sp they called him up. the Twins optioned him back to Rochester on Monday. He had just one day on the active roster. On Tuesday Hector Santiago's grandmother died. Santiago made his start on Wednesday. Thursday was an off-day. Santiago went on the bereavement list Friday and Boshers was called back up. He pitched Friday in Kansas City (and gave up a homer to a left-handed hitter, a no-no for a LOOGY). Bereavement leaves don't last long, and Santiago is to start return Monday, so Boshers isn't likely to stay long this time around either. Jim Callis is one of MLB.com's prospect writers, and while stuck in an airport Thursday did a Twitter chat about the draft. The above was his response to a question about whether the Twins would go hitter or pitcher with the No. 1 overall pick. 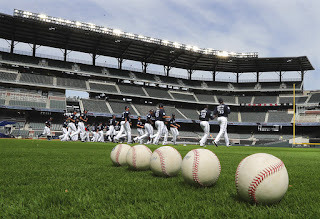 A John Manuel piece posted Thursday by Baseball America examines why college hitters surge up draft boards every year. It might help explain why McKay might be viewed as a hitter rather than as a pitcher. I got up early this morning and perused this list of the "talent" axed Wednesday from ESPN. There are, to be honest, a lot of names here that mean little or nothing to me. And a number that do matter to me. I follow baseball hard, other sports only enough to remain competent at my own newspaper job. Some of the baseball reporters/analysts who lost their jobs, I'll miss. Jayson Stark, Doug Glanville, Jim Caple, Boog Scambi, Dallas Braden, to name five. A few, like Jim Bowden, I kinda wonder what took so long. There was a lot of wailing and knashing of teeth in my Twitter feed about the layoffs, much of it based on the idea -- probably correct -- that ESPN was damaging its ability to conduct quality sports journalism. But let us not kid ourselves. ESPN, at this stage of its existence, isn't about quality sports journalism. It's about being a major profit center for Disney. And that mission is in jeopardy today. Thirty-five years ago, when I first got cable, ESPN was one channel -- a bit amateurish and short of resources, but ernest and energetic. Today it is mammoth and slick. It has consumed ABC Sports, once a major brand. A serious portion of my cable bill is devoted to ESPN and its family of channels. But it's also caught in its own success. Rights fees to games are spiraling upward, in part because other entities have emerged to compete with the Bristol behemoth. At the same time, people younger than me are a lot less likely to fork out the money for cable. ESPN has been sucked into the media disruption later than newspapers, magazines, terrestial radio and over-the-air TV, but sucked in it is. And I will guarantee you this: ESPN knows its audience a lot better than you and I do. I find it disgraceful that Stephen A. Smith has a job doing what he does and Jayson Stark does not, and it's tempting to say that that reveals what ESPN values. What it really reveals is what ESPN believes the audience values. Scratch Ryan O'Rourke from the 2017 Twins pitching plans. The lefty specialist is to have Tommy John surgery. That news came quickly after his consultation Tuesday with the Rangers team physician. So that's two pitchers who injured their elbows during training camp and needed the ligament-replacement surgery. The first, Trevor May, is also with the team in Arlington, Texas, checking in with the same doctor (Keith Meister) on his rehab process. Eric Thames bounced around American ball during his early 20s, hitting 31 homers in 700 at-bats with Toronto and Seattle. Then he went to Korea and mashed for three seasons. Now he's 30 and back in the majors with Milwaukee and still mashing; he hit his 11th homer of the young season Tuesday night. And as the Cubs, apparently startled that there might be a good player on another team, imply that he's obviously using, the "random" drug tests seem to land on him a lot all of a sudden. Thames' numbers in Korea are impressive -- but not as impressive as those of Byung Ho Park. This is what Park was supposed to be doing. And still might, if he can get back on the field and get another shot. I still believe in him. reinventing his pitching approach, with a heavier diet of changeups, remains a work in progress. Also fairly obvious: 50 percent quality starts is a better rate than we're seeing from Kyle Gibson. Buddy Boshers didn't last long on that callup. He pitched Sunday -- long enough that he wouldn't be available for a day or two -- and was shipped back down Monday. Nick Tepesch was called up, and Ryan O'Rourke was put on the 60-day DL to make room on the 40-man roster. Tepesch was apparently nearing his opt-out date. He was putting up better numbers than Boshers in Rochester, and he's a better fit for the long man role anyway. O'Rourke is making little progress with his arm injury and is to get a second opinion today from the Rangers team doctor. The lefty hasn't pitched off a mound in six weeks. MLB issued a one-game suspension for Miguel Sano.for his role in Saturday's fracus. He's appealing the suspension, so that's in abbyance. What frequently happens in these cases is that the Twins and Sano will pick a game that they plan to rest him in anyway and drop the appeal. Reading between the lines, that may not happen this time. They may think they have a legitimate chance to win that appeal. I do find it amusing that the Twins TV crew seems absolutely intent on ignoring the underlying trigger of the sequence of events: Justin Haley hitting JaCoby Jones in the face with a pitch. Matt Boyd at least kept his pitch below the shoulders. Chih-Wei Hu, the Taiwanese righty the Twins signed, then traded as a Class A pitcher to Tampa Bay for Kevin Jepsen in 2015, made his major league debut Monday. I wish him well; I said at the time of the trade that I was lukewarm on it, having already made an emotional investment in Hu after seeing his Low A debut in 2014 while recognizing the Twins need for immediate bullpen help at the time. It was, and remains, a justifiable trade. The Twins got what they were after in 2015 from Jepsen; he almost got them into the playoffs. He crashed and burned the next year, of course, and he doesn't appear to be in organized ball this year. Well, that was a bummer of a homestand. The Twins went 2-7 (with a rainout). Even worse than the record was the play. The fielding, which had been a strength, got downright sloppy during the weekend. The Twins have only been out of four games this season, but three of them came in the just completed homestand, including the final two. Sunday in particular was an echo of the dreary play of much of 2016 -- hittable pitching plus unmade plays equal lots of runs. Some roster shuffling took place: Fifth starter Aldaberto Mejia was optioned out after his poor start on Saturday, and long man Justin Haley went on the 10-day disabled list. Haley is a Rule 5 guy, and his DL time doesn't count as roster time, but he can spend a good part of the season on DL without jeopardizing his status. I'm in no position to question the diagnosis of biceps tendonitis, and he has been worked pretty steadily (13 innings, more than Mejia and close to that of two other starters), but the timing of the injury is pretty convenient. Up are LHP Buddy Boshers and 1B/DH Kennys Vargas. Boshers is not a good fit for the long man part of Haley's role, and the sudden lack of innings from the back end of the rotation make this an odd time to strip length from the 'pen. The Twins apparently intend to use just four starters the next couple of weeks (there are off days), and it may be that they will try to stretch out Tyler Duffey for the rotation in the meantime. As for Vargas ...Paul Molitor has been grumbling about his lack of bench options late in games, and that is a genuine issue. But getting Vargas at-bats will be ... interesting. Robbie Grossman has been a productive designated hitter. Joe Mauer has not hit particularly well, and Byron Buxton has been horrendous at the plate -- and a pair of homers during the weekend not withstanding, Eddie Rosario hasn't been productive either. Molitor could cut back on Mauer's playing time, particularly versus lefties, and give Vargas time at first base. He could give Grossman more outfield time at the expense of Buxton or Rosario, freeing up the DH spot for Vargas. Any of those moves weakens the defense, and that creates more problems for the pitching. An interesting set of numbers so far for the great Pujols, who is, at age 37, clearly not the monster he was in St. Louis. In his first 17 games, Pujols had a slash line of .203/.247/.319. He also had 14 RBIs. Ah, you say, he's coming through with men on base. Not really; he's slashing .208/.269/.375 with men in scoring position. That's better than his overall numbers, but not a lot. Pujol's RBIs are more because he's hitting behind Mike Trout than anything he's doing. The Twins won Friday night. They won because they scored six runs in the sixth inning, and they scored six runs in part because the first three hitters that inning drew walks. The Twins lead the majors in walks drawn so far. They aren't doing much else particularly well at the plate, but they are drawing walks. The 2017 Twins so far seem fairly good at preventing runs. If they keep drawing walks, they'll eventually score more runs. Lots of baserunners = lots of runs. Baseball America on Thursday released Mock Draft 2.0. This time they have the Twins bypassing Hunter Greene with the first overall pick for Brendan McKay, LHP-1B at the University of Louisville. Rumors of the Twins floating deals with several players are circulating, with players as disparate as Southern California prep Royce Lewis to Virginia first baseman Pavin Smith. But the least controversial player on the board is Louisville’s two-way star Brendan McKay, whom the Twins would pick as a pitcher. Hunter Greene, the top prep player on the board and owner of a 100 mph fastball, has had an up-and-down spring, and the rumors of he and his family attempting to maneuver his way to the No. 3 pick with the Padres are a poorly kept secret. The Padres’ throwing program is more in line with Greene’s program, and it’s on the West Coast, among other advantages. Greene isn’t pitching this week in the Boras Classic and is widely believed to be shutting down as a pitcher in another attempt to move down to the third pick. My at-a-distance sense on the choice between Greene and McKay is that Greene should be the pick on the basis that he has the higher ceiling. I have seen reports on McKay describing him as a No. 3 starter -- which is not to be sneered at, but doesn't evoke daydreams of a dominant, Hall of Fame caliber starter. But McKay is also described as sufficiently polished that he could pitch almost immediately in the majors. Low ceiling, perhaps, than Greene, but also a higher floor. What if McKay's ceiling is MadBum and his floor is Ted Lilly? And Greene's ceiling is Verlander and his floor is Brien Taylor? About seven weeks until the draft. The Twins had a rainout Wednesday and their first truly poor game of the season on Tuesday. Their record has subsided from a 100-win pace to .500. And Robbie Grossman has gone from zero innings in the field to a pair of starts in right. So I figured it was a good time to check the updated defensive efficiency stats for the Twins. This was the major topic of the Monday print column, for which I used the number listed on Baseball Reference through last Saturday's games. The Twins led the majors at that point, having turned 78.6 percent of balls in play into outs. As of this morning, B-R had the Twins still leading the majors in defensive efficiency at .763. That's more than 100 percentage points higher than Cleveland, which sits last of the 30 teams, and 17 percentage points ahead of second-place Miami. It's also, to be sure, a drop-off of 23 percentage points in three games. As noted in the Wednesday post, it's early in the season, and the stats haven't had time to stabilize. I do think this defense has a chance to be quite good, but the continued deployment of Grossman and Danny Santana in the outfield won't help. Here's an indication of how fragile the statistics are this early in the season: The Twins gave up nine earned runs Tuesday nignt (and two unearned ones), and their team ERA rose almost a half run,. Joe Posnanski wrote the other day about what he calls "Teddies" -- batted balls that, according to Statcast have at least a 40 percent chance if being hits that are instead caught. (It;s near the end of the longer linked piece, but it's there). Joe Mauer, with seven, is one of the leaders in Teddies, according to Pos. His luck hasn't been as bad as Nicolas Castellanos', but it hasn't been good either. If three of the seven drop in, Mauer's batting average would be 47 points higher. Again, an indication of how little weight the stats should carry this early in the year. The news Tuesday that Pirates star Starling Marte had tested positive for a PED was a bit of a stunner. And since the specific substance (nandrolone) is said to be injected, I find it difficult to buy the implied claim in Marte's statement that it was a mistake. So he's gone for 80 games. Infielder Jung Ho Kang, another of Pittsburgh's better players, is in South Korea, unable to secure a work visa after his latest DWI conviction. It's not looking good for the Pirates this year. About the time Kyle Gibson was getting pulled from yet another of his "is that all there is" starts Monday -- 5.2 innings, eight hits, three runs -- somebody in my Twitter feed opined that he'd make a fine middle reliever. A few innings later, Tyler Duffey wrapped up his day's work: 2.2 scoreless innings. Duffey, of course, was a starter last year for the Twins and now is in their bullpen. He has now worked 8.2 innings this season without allowing a run. Would Gibson be better out of the bullpen than as a starter? Probably, if only because almost everybody's stuff is better in short bursts. All of which led me once again to one of my favorite outside-the-box ideas: A pitching staff without traditional starters. Imagine a nine-man staff, divided into three groups of three pitchers. Each pitcher in each group works three innings at time, and the groups form a three-day rotation. In theory, you'd have nine pitchers making 54 appearances and throwing 162 innings apiece. In theory. This outline assumes no extra-inning games, no scheduling headaches such as doubleheaders, and -- perhaps most unlikely -- that every one of those 486 appearances are successful enough that nobody needs to get pulled before completing his three-inning assignment. And history suggests that 160-plus innings is a career-sapping workload for a reliever. So nine pitchers probably aren't enough to make this work. Maybe 11 or 12 is. (Even 12 would be fewer pitchers than the Twins are carrying now.) But there are other problems. Pretend that the Twins decided to do this. Are veteran starters like Ervin Santana going to be happy working three innings at a time? Do you want to pay Santana and Phil Hughes $26 million combined for 162 innings? And if you trade your established starters so you can commit to this radical idea, what happens if it fails? Answer: You get fired. And your organization is probably set back for years. Back in his final years in Oakland, Tony LaRussa experimented with something like this idea, and he abandoned it about two weeks in. It probably takes a manager of LaRussa's stature to try it and not be immediately crucified by the media or abandoned by his players. Or an expansion team, if we ever see one of them again. The roster compiled by an expansion team should be filled with pitchers willing to take any role to be in the majors, even that of a three-inning starter (who can get a loss but not a win). So far in the still-young season, it's tempting to say scoring is down. Entering Sunday's play, major league teams were averaging 4.25 runs per game. (The Twins were scoring 4.73 and allowing 2.45.) In 2016, for the full season, teams averaged 4.48. But ... these averages are not directly comparable. The 2017 numbers are, obviously, based on early April, probably the unkindest weather of the season for hitters. In games of March/April last year, teams averaged 4.23 runs a game -- almost exactly what they were averaging this year. The Twins have played a lot of day games so far and have not had a game further south than Chicago. While I wouldn't call conditions so far brutal -- they've certainly had harsher springs than this one -- run scoring will almost certainly pick up as the weather warms. 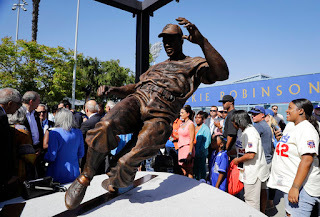 Saturday was Jackie Robinson Day -- the anniversary of his 1947 major league debut, breaking the long-standing color bar in baseball and advancing the cause of civil rights -- and the Los Angeles Dodgers marked the occasion by unveiling a Robinson sculpture outside the stadium. The story of Rod Carew and his heart donor is, of course, a tremendously moving one. How could it not be? All heart transplant stories are: Someone dies, and someone else gets a new lease on life as a result. That was the first time Konrad gave his heart to Rod Carew. Dan Gladden spent a goodly part of the early innings Thursday complaining that the Twins were hitting too many balls in the air. Detroit starter Jordan Zimmermann was getting his outs on strikeouts and pop ups; the Twins needed to start hitting balls on the ground, or so the radio analyst insisted. He stopped around the time of the Twins second home run, certainly by the third. Here's the thing: Ground balls aren't that good for hitters. The point is pretty obvious: You want to hit line drives. There is a slightly higher batting average on ground balls than flyballs, but flyballs are a lot more productive because darn few grounders turn into home runs. The Twins had one groundout against Zimmermann on Tuesday (4.2 innings). They scored five runs. They had four groundouts gainst Shane Greene (two innings). They scored zero. I am reminded of a line in "Pennant Race," Jim Brosnan's journal of the 1961 Cincinnati Reds unlikely pennant winning season. 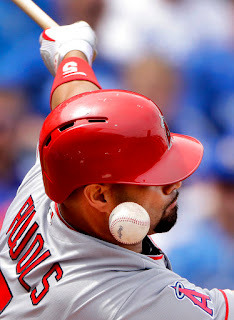 The Reds are in a slump, the team is having a players only meeting, and somebody says: If you gotta hit a ground ball, knock the second baseman over with it. * Same Old Gibby. I may turn this into a standard acronym, SOG. Kyle Gibson was really impressive during spring training, and I started to have hope that his revised mechanics would unlock finally make him a pitcher worthy of the 14th overall pick. He was excellent for three innings Wednesday. In the fourth his command just vanished, and it was only a matter of time. SOG. Five runs allowed in the fourth, and he didn't come out for the fifth. * It was Byron Buxton's turn to sit Wednesday -- Paul Molitor has used eight different batting orders in eight games -- and it was noteworthy that Eddie Rosario played center field, with Danny Santana in left. * In a somewhat related note, Robbie Grossman has yet to play even an inning in the field. The more I see and know of Hector Santiago, the more intriguing I find him. So he's two-for-two in quality starts. What's unusual about him is the breadth of his repertoire. He told Bert Blyleven in a radio segment aired before Tuesday game that he's up to six pitches (four-seam fastball, two-seam fastball, change, slider, screwball, cutter) -- and working on a sidearm delivery that would add four more to the arsenal if and when he breaks it out in a game. That approach used to be common among big league pitchers, but that was about 70 years ago. Today's pitching theory is more focused on a executing a tighter selection of pitches consistently. Brett : How many of Buxton, Sano, Kepler, Rosario and Polanco will become above average everyday regulars? Keith Law: Yes, yes, yes, no, maybe. Kevin: If you're the Twins, how do you pass on Hunter Greene? 102 at 17 y/o? Lord. They need pitching, but he gives you two potential players in one to bank on. Also, Falvey known for developing pitchers in CLE ? great match. Kid seems like he "gets it" too. Keith Law: I think you take him, you send him out this summer as a shortstop, with the plan to pitch him in 2018. Maybe he does something either way as a hitter in the GCL to change your mind or reinforce it. Jim: Travis Blankenhorn look like the future 3B of the Twins? Keith Law: You know, I saw him last week in Fort Myers, and 1) oh my god is he huge and 2) he actually wasn’t that bad at third for a guy his size. Maybe he’s a 2b instead, but he can scorch the ball. Thirteen pitchers on the Twins roster mean just three reserves for any given game, and Paul Molitor felt a bit constricted as he tried to work an extra run out of their ninth inning rally. Molitor on late innings: "We were looking at different scenarios on how you best use our minimal bench." 13-man staff could end soon. OK. To be sure, Molitor hasn't had to go to the 'pen nearly as often as they were expecting. Michael Tonkin made just his second appearance Tuesday. Craig Breslow has pitched once. The question becomes: Who goes? Justin Haley is a Rule 5 guy; he either stays or is lost. Tonkin is out of options; he wasn't particularly high on my list of candidates, but he might be the best "stuff" pitcher in the 'pen. Breslow is long out of options. Taylor Rogers and Tyler Duffey are optionable, but Molitor is using them in game situations. Brandon Kintzler, Ryan Pressly, Matt Belisle -- they aren't going anywhere. My guess: If they make a move to add a hitter, it will be at Tonkin's expense. My further guess: If they do cut back to 12 pitchers, that's when they'll get a string of short starts. Yadier Molina last week got a contract extension through 2020 from the St. Louis Cardinals. He turns 35 in July, and he's been worked pretty hard behind the plate, so this doesn't strike me as a particularly wise investment. On the other hand, he has for a dozen years been at the center of a team that has won two World Series, lost two others and been in the postseason nine times. He's a franchise icon. Pay the man. Yadi's new deal spurred an internet debate over his merits as a Hall of Fame candidate. I'm a "Big Hall" guy, so I haven't any problem with seeing him get a plaque at Cooperstown, but there are other catchers I'd rather see inducted first. A guy named Scott Lindholm tweeted out the above graphic as evidence that Molina is a bit shy with the bat for the Hall. Molina is down in the lower right -- excellent receivers whose hitting was below average. The further to the right, the better the defense; the further up, the better the hitting. I'm not competent to defend the Baseball Reference fielding runs metric, but I will say that these graph points make intuitive sense, by and large. 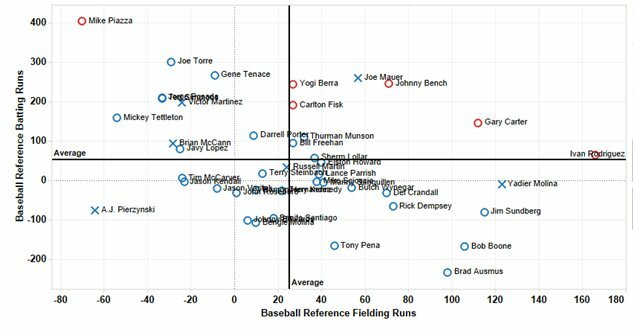 You'll notice that that Hall of Fame catchers, with the exception of Mike Piazza, are all in the upper right quadrant -- good hitters, good defense. The only eligible guys in that quadrant who aren't in are all in the corner next to the intersection of average: Bill Freehan, Thuman Munson, Sherm Lollar. 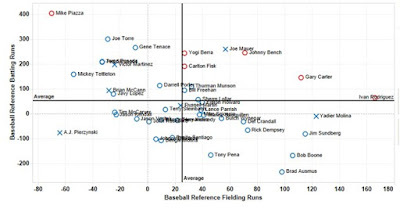 And notice that X up there between Yogi Berra and Johnny Bench. That X signifies an active player, and it's Joe Mauer. Mauer, in my view, did the heavy lifting for the Hall in his 20s. His 30s have been a letdown, and, of course, he will never catch again. And he's not likely to compile the big bulk numbers the voters seem to demand of hitters. A lot of people believe Mauer will fall short of the Hall, and they might be right. But the generation of voters who would be likely to turn thumbs down on Mauer for lacking the home runs and RBIs of the HOF catchers represented in this graphic is dwindling. The percentage of the electorate that embrace B-R's metrics is only going to rise. Six games into the 2017 season, that's what the Twins opponents are averaging. Two measly runs per game. Six games isn't much; it's two series, and one of those series was against a team that went into teardown mode this winter (the Chicago White Sox). Minnesota's 5-1 record may prove a mirage. But what we've seen so far is a far cry from the pitching-and-defense ineptitude of 2016. But Jorge Polanco has been far better at shortstop than I expected. Miguel Sano had a rough game Saturday at third -- two errors, one on a botched rundown that directly resulted in a run -- but other than that, the infield defense has also been superb. If this pattern of stellar defense continues, 5-1 may not be a mirage. 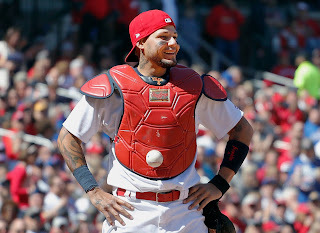 Molina belittled reporters after the game for asking about the sticky stuff on his equipment, but there's one obvious reason to have so much of it that a ball can't drop off: So that he can load balls with a foreign substance to aid his pitchers. This is hardly unheard of for catchers; Jim Bouton in Ball Four discribed various ways Elston Howard scuffed balls for Whitey Ford back in the 1960s. MLB, it was reported Friday night, has decided not to discipline Molina. I don't get it. Maybe the loss was deemed punishment enough. Paul Molitor has deployed four different lineups in four games. Last night's lineup not only got Chris Gimenez his first start behind the plate, but featured Miguel Sano at first base, a position he is not believed to have worked at even once during spring training. Molitor himself donned a glove during the pregame warmups to supervise Sano taking grounders and throws at first. The expectation in March had been that either Byung Ho Park or Kennys Vargas would be on the roster as the DH and backup first baseman. When they were both sent to Triple A Rochester, my expectation was that Max Kepler would be the first baseman when Joe Mauer sat. There are advantages to shifting Sano to first rather than Kepler. The main one is that it gives Eduardo Escobar a chance to play (at third). Of the three reserves (Escobar, Gimenez and Danny Santana), Escobar is pretty clearly the one who with the best chance at being a productive regular. Kepler -- a better outfielder than Santana or primary designated hitter Robbie Grossman -- made a nice catch in right Friday night. Sano doubled home the run that put the Twins up for good and didn't obviously mess up any plays at first. Escobar walked, singled and scored a run. Even Gimenez doubled. So Friday's lineup shuffle worked marvelously for Molitor, and the Twins are 4-0. The Twins won again Thursday. They remain on pace to go 162-0, which would be some kind of record record. I have been in recent days re-reading Bill James' "Guide to Baseball Managers," a book that came out about 20 years ago. I cracked it open to revisit his research on optimizing batting orders (see this Monday print column and this post) and kept reading a few pages at a time during my dinner breaks at work. Last night I ran across a formula for establishing the "win expectations" for a specific team, and since the question of what we should expect from the Twins was the subject of a post earlier in the week I thought I would run it for the 2017 Twins. The formula is: 50 percent the previous year record; 25 percent a .500 record (because all teams tend to head for .500); 12.5 percent the record from two seasons back; and 12.5 percent the record from the season before that. Total: 551-745, a .425 winning percentage. Which, over 162 games, comes to 69-93. Which is three games better that what I suggested would be a baseline expectation for this team, and considerably more likely than 162-0. Just 160 more wins and the Twins will have the undefeated season. Two games is, obviously, insignificant in terms of drawing conclusions, but 2-0 is a whole lot better than 0-2, and it's been a long time since the Twins did 2-0 to open a season. As light as the sample size is, the Kansas City Royals have convinced me already that what had been their greatest strength -- the depth and quality of their bullpen -- is now a significant weakness. The 2014-15 Royals went to consecutive World Series, winning one, with a mediocre rotation because they had a relief corps that could routinely strangle lineups for three, four, five innings a game. The rotation now is, if anything, weaker with the death of Yordano Ventura, and the bullpen is too thin to compensate. That may be a negative conclusion, but it's a conclusion nevertheless. I don't know that the Twins are going to contend in 2017, but I'm sure the Royals won't. With better fundamentals and more success late in games, Molitor told (the new front office chiefs), the Twins would be much better than their 59 wins without dramatic changes. After checking the analytics, Falvey and Levine bought into the message. A fellow who was part of the group with which I attended Monday's game isn't buying into it. He repeatedly insisted Monday that this year's model will finish several games worse than 2016's squad. Not likely. The 2016 team's won-loss record was markedly worse than their underlying numbers suggest. The "pythagorean theorum" devised decades ago by Bill James to calculate an expected record from runs scored and runs allowed says the Twins "should" have gone 66-96, which is not a good record at all but is still seven games better than the 59-103 they did record. That wasn't the worst underperformance of 2016 (Tampa Bay missed by nine games), but it's close. The 59-103 mark is real. The 66-96 pythagorean record is probably a better indicator of how bad the team actually was. The point being ... to get to the 109 or so losses the guy on the bus claims to anticipate, the new, younger Twins would have to decline probably not only six games in results but another seven or so in the underlying stats. In a sense, Paul Molitor is trying to catch a falling knife. If the 2017 Twins finish with a 66-96 record, that seven-game improvement is likely to be discounted by Derek Falvey and Thad Levine, the manager's new bosses. Sixty-six wins is probably the baseline. A 70-92 record would be an 11 game improvement -- and less than that in the eyes of Molitor's most important beholders, and likely in Molitor's estimation as well. There's a line of thought that Molitor is being set up to fail by the new front office, which inherited him as manager. That implies a bad faith I doubt is actually at work. If Molitor -- who is in the last year of his contract -- is dismissed after the season, it will be after a legitimate opportunity and, presumably, legitimate failure. We haven't gotten there yet. * Kramarczuk's is still so good. * The first-level concourse was almost impassible, a chronic condition on opening day when Target Field is sold out and a goodly number of fans flock to the standing room areas and the heat lamps. It may have appeared on TV that there were a lot of empty seats. I can assure you, the people were there. * The Kansas City bullpen ain't what it was in their World Series years. * The lineup against lefty Danny Duffy was ... restricted. The Twins had, by necessity and choice, four lefties in the lineup, none of whom at this point in their careers should be expected to be productive against a southpaw of Duffy's quality. Joe Mauer slashed .224/.291/.319 against lefties lat year; he hit cleanup. Jason Castro slashed .149/.237/.241; he hit sixth. Max Kepler and Eddie Rosario slashed .203/.273/.322 and .263/.305/.289 respectively; they hit eighth and ninth. The problem: With Robbie Grossman as the DH, there is no viable right-handed hitting alternative on the roster to Mauer, Kepler and Rosario. Chris Gimenez would be a reasonable platoon mate to Castro, but Paul Molitor has indicated that he's not going with a strict platoon behind the plate. And, to be sure, even Earl Weaver wouldn't be platooning Kepler or Rosario at their ages. So we're likely to see more of this. * The game itself turned on a pair of bunts, which merits a deep dive. Bottom of the seventh, 1-1 tie, the Royals pull Duffy. In 2014 and April of 2015, that probably means the gas-throwing Kelvim Herrera, with Wade Davis for the eighth and Greg Holland in the ninth, and the Twins' best shot at winning is getting to extra innings. But Holland blew his arm out late in 2015, and Davis is a Cub now, and Herrera is the closer. As said above, the Royals bullpen isn't what it was. So with a switch-hitter (Jorge Polanco) followed by a pair of left-handed hitters (Kepler and Rosario) due up, K.C. manager Ned Yost goes to Matt Strahm, a lefty making his major league debut. But it's the bunting I want to comment on, not four walks in five hitters. Let's say that Kepler merely got a sac bunt, not a hit. In that case, Rosario has to hit, not bunt, against the lefty and the whole inning changes. A mere sacrifice from Kepler puts the inning squarely on Rosario and Grossman (there's no way Yost was going to pitch to Dozier with first base open). For that matter, I question Yost's decision to stick with Strahm after Rosario's bunt with Dozier-Grossman-Byron Buxton coming up -- two righties with switch-hitter who is better against lefties. Peter Moylan (who did come in to strike out Buxton) might have fared better; He couldn't have done worse than Strahm. Seeing the two young left-handed hitters get the bunt down against a lefty was encouraging, and the inning certainly broke in the Twins favor. But they needed some help to make it work. The regular season began Sunday afternoon -- with a game in St. Petersburg, Florida, and a game in Phoenix, each of which involved two teams that hold their spring trainings in those areas. Which is one way to reduce travel expenses. And there was a night game in St. Louis, which doesn't fit that weak joke, but did involve the defending champions. I'll just make one comment on Sunday's outcomes: It's always good to see the Yankees at the bottom of the standings. And it's even better to see the season underway. As I said in the Monday print column, I'm not particularly optimistic about the Twins' 2017 chances. But I'll be at Target Field this afternoon for the opener, and given the vagaries of April weather in Minnesota in general and today's damp forecast in particular, that's a gesture of optimism. in suburban Cobb County for an exhibition with the Yankees. 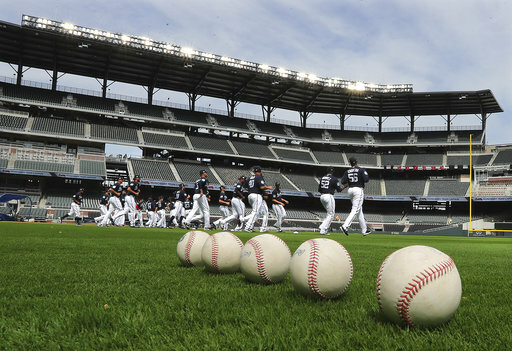 The first official game in SunTrust Park isn't for a couple more weeks, but -- as is typically the case with new stadiums -- it got a test run last week with a couple exhibition games. It will get another test next week with a college game. What nobody anticipated was the collapse of a freeway overpass that will shut down a major traffic artery in what is already one of the nation's most congested metropolitan areas. It's gonna be a mess. One of the 13 pitchers coming north for Monday's opener is Justin Haley, acquired in the Rule 5 draft. As you probably know, Rule 5 picks must be carried on the active roster all season, which makes Haley essentially use or lose. In the same draft in which the Twins landed Haley, the Cincinnati Reds selected catcher Stuart Turner from the Twins. Turner will open the season as Cincy's No. 2 catcher. I don't know if Turner was the guy the Twins left off their 40 in order to make a Rule 5 selection -- it's certainly possible that somebody else would have been the next player protected -- but in a sense the Twins gave up Turner for Haley. A similar exchange occured in 2015, when the Twins lost left-handed pitcher Sean Gilmartin in Rule 5 and got J.R. Graham. Gilamartin had a better 2015 for the Mets than Graham did with the Twins, and the Twins waived Graham last year. Now they have neither, and my guess is that Gilmartin has a better chance to be a useful pitcher. Turner was a third-round draft pick by the Twins in 2013. He's a light hitter but well-regarded defensively. But Mitch Garver (ninth round in the same draft) vaulted over him last season in the Twins estimation. It's far from certain that Haley and Turner will both make it through the season. Turner's fate may ultimately depend on the health of Devin Mesoraco, their intended No. 1 catcher who has proven injury prone and is coming off shoulder surgery. He's opening the season on the disabled list, and even if/when he returns, the Reds may be wary of losing Turner and then seeing Mesoraco get hurt again.